Former Loretto pupil Jamie Parker (1997) wins Best Actor at Olivier Awards for his portrayal of Harry Potter Jamie left in the upper sixth to attend the Royal Academy of Dramatic Arts in London. 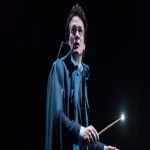 “Harry Potter And The Cursed Child”, in which Parker played Harry Potter, made theatre history at the awards at the weekend, after winning a record-breaking nine Olivier Awards. Parker told how his predecessor in the role, movie actor Daniel Radcliffe, gave him his blessing before opening night. "He sent flowers and a card encouraging me to enjoy the role," he said. "It's all about enjoying the role, which is a funny thing to say when you are playing somebody who would arguably have post-traumatic stress syndrome." Talking about transferring one of the most successful book series and movie franchises of the generation to the stage, he admitted that anything less than a box office smash hit "would have been a catastrophe". But he continued: "It was like turning up and just working on a cracking new piece of writing, except with lots of toys to play with. It's a joy seeing how much it means to people." He starred on stage during his time at Loretto, playing roles as diverse as Mr Bumble in “Oliver!' to directing and playing the main part in “Sleuth” by Anthony Shaffer. Jamie is now an acclaimed British actor and received excellent critical reviews for his title role in Shakespeare’s Henry V at the Globe Theatre, London, in the summer of 2012. He had parts in the film “I’m Valkyrie” with Tom Cruise, and, on television, in “Parade’s End”, “Silk”, “Silent Witness”, “Wire in the Blood” and “Foyle’s War.” Jamie also recently scooped the “What's on Stage” award for “Best Actor in a Show”for his performance as Harry Potter in Harry Potter and the Cursed Child. He returned to his alma mater to enthral an audience with tales of his life in acting.